It was not my idea to go on a cruise. Instead, it was a generous offer from my mother-in-law, who was dedicating her winter to two halves of the same Caribbean route all winter and was inviting family members along for individual legs. It was for a ship, I was delighted to find, that was connected to “The Love Boat,” that nostalgic bit of corn from the past in which stars of faltering luminosity took each week’s guest star spots, meeting and matching up in a format that would now be seen as innovative — an hour-long romantic comedy with canned laughter. Continuing roles were offered by the permanent cast, playing ship captains and mates, roles that in real life were also by definition recurring roles to the guests coming and going each week. Watching old episodes of “The Love Boat” each night on the ship’s video service seemed the perfect way to cap and summarize the odd days on the ship, though by now the Princess lines were much larger than the ones depicted (and promoted) in the TV show. Some 3,500 vacationers were on this 19-story floating hotel, moving ominously through the Caribbean sea and altering skylines of each of its island stops. It was as luxe as a posh mall, with its marble and gold accents and swirling staircases and polished wood. And like the posh mall, it had a lot of jewelry shops, “fine art,” glittery cruise wear and other things catering to this group, the vast majority of which had done this before. The Princess is a British line (and the new ship, less than two years old, was christened by Princess Kate Middleton, an event noted in one display case (that features the stylish maternity dress she wore). The British tenor is also felt in things like afternoon tea, but also in the crew, from the dour captain, to the exuberant cruise director, who comes out of English music hall traditions of corny song and dance, old jokes and a wink of an eye. That music hall tradition was also evident in some of the entertainment on board, in its necessary broad appeal. Second only to food, available in more rooms than I eventually found, in buffets and formal sit-downs, the big nightly thing was the 700-seat theater show that involved a sing and dance troupe. In saucy costumes and fussy, flashy productions, they put on four different shows, one saluting Bacharach, another Motown; two others came under broad themes of “Colors of the World” (from a Michael Jackson lyric) to a “Spectacular” that ended with an M.J. medley. 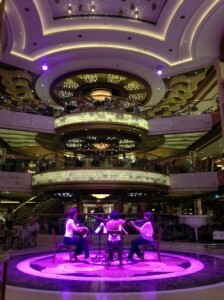 In the three-story atrium, there could be anything from a string trio to a crooner with a jazz quartet. But mostly it was a five-piece combo playing contemporary music, and contemporary music that meant anything from the Beatles to Santana, whose “Smooth” was played again and again because some lady kept requesting it. 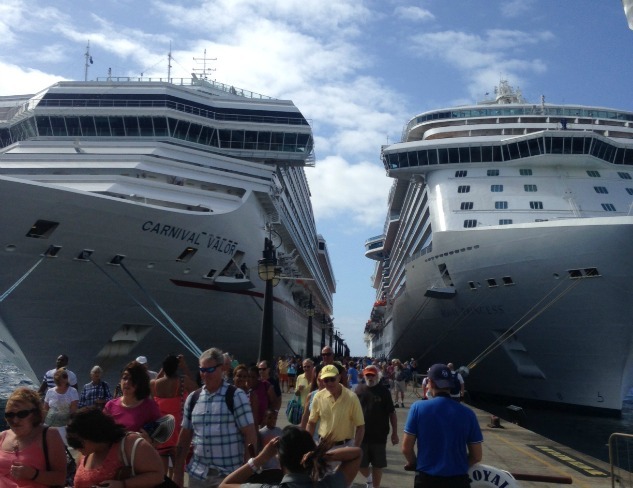 Yes, most the people on a cruise are old to elderly. A child was an oddity to behold, but so were teenagers and people in their 20s. Nevertheless, they were there to have fun, so would dance to everything this band would dish out. We hung out with the young drummer of this outfit one day on a shore excursion; he said he had been on other cruises, and when he got the gig with this band, got a list of 200 songs, flew in and started playing. They never did rehearse once. Because this was a Caribbean cruise, there was a steel pan player who did old R&B song in the ringing Trinidadian style, accompanied by a backing track. More often there were pianists — one playing rushed version of cocktail songs, the other demanding attention with Liberace style and an insistent crowd involving singalong style. There were pub quiz trivia contests from 9 a.m. to 9 p.m. I did OK but never won. There were always people who claimed to have perfect scores. The prize were clips that would affix your beach fowel to the hundreds of beach chairs on the deck that had two pools, four hot tubs and a stadium screen that didn’t stop. Like airlines, cruise ships get fairly recent films to show, so it was a good time to play Oscar catchup. I never would have seen “Whiplash,” “The Theory of Everything,” “Wild” or “Foxcatcher.” I never did catch up to “The Imitation Game.” And when I recommended the one movie I had seen, “Birdman,” to the Kansas City retirees at my table, they mostly walked out. I never picked up on the Tanzanite craze they were promoting in the jewelry counters, but was fascinated by the whole schtick of the “fine art” gallery, attending lectures turned sales pitches that tied the history of art to the genius of Peter Max, the poster artist named America’s artist laureate and other names whose work has yet to be even that well known, let alone make museums. There is a vivid garishness to a lot of the work they were showing — as flashy and ostentatious as that behind the ring counters, with bright violets and oranges to call attention to themselves. The middlebrow mall master Thomas Kincaid was represented at the art auction, which was not conducted like an auction at all. They were reproductions of his art, but they did have his DNA in them, the officious art director said, because Kincaid retains his hair clippings when he goes to the barber, and inserts one or two with his signature, we were told. Other works, obviously reproduced as well, nonetheless had “hand embellishments,” I suppose to make them unique. But what did this mean? Errant brushstrokes here and there? There was a whole day built around a Rembrandt etching that was really an image of an image of an image. But still, it was extolled as top flight (As if he was Peter Max or somebody!). There was a casino, which I only walked through when I had to; and a smoking lounge that was a cloudy room where people talked about their casino experiences. Mostly, the boat, grand as it was, was a good way to skip across the islands of the Caribbean — U.S. possessions (St. Thomas and St. John’s), British (St. Kitts) and independent (Barbados, Antigua). One seemed to be owned by Princess lines: the little playland they called Princess Keys off the lower tip of Eleuthera.